Picture this: You’re a small business owner and have grown significantly during the ten years you’ve been in business. When you started the company, you had a friend with some design experience create a simple logo and a simple brochure website for you. After a few years building up your clientele and adding employees to the team, you decided it was time to freshen your look to be more professional and polished. You partnered with a local marketing firm to update your logo, color palette, and website. Once all of these elements were in place, you started to see positive results. The business continued to grow with more referrals, employee morale was high, and customer ratings were positive. You and your team continued to ride on this growth pattern for a few years, keeping things just as they were, because why fix what isn’t broken? Until one day, seemingly out of nowhere, it was broken. Brands don’t just stop working overnight. It can be difficult to pinpoint exactly when the brand started to take a downturn, or what factors played into its demise—mostly because business owners are so heads-down in the business side of things that it’s easy to lose focus on the brand. And when business leaders aren’t fully aware of what’s going on internally—with their employees, their brand and its reputation—that’s when the brand can quickly and easily deviate away from itself. If any of the above apply to you, it’s likely that your brand is in need of some TLC. But before you dive in (or better yet, seek a professional brand marketer to guide you through the process), there are some factors you should take into consideration first. Whether you’ve already convinced yourself that your business is in need of a rebrand, or if you still aren’t fully convinced, the rebranding process isn’t something you can quickly and easily jump into and implement. Rebranding is a process that takes thoughtfulness, consideration, time, patience, cooperation, and of course, money. Not only this, but rebranding also takes 100% commitment from ALL stakeholders. Are your business partners ready and willing to: Put in the hard work over the next several months (and years)? To have the tough conversations and take ownership of the brand’s current state? To bring your employees up to speed? And most importantly, are they willing and able to accurately and consistently manage and promote the brand? How different is our company today than three, five, even ten years ago? What has changed about our company? Do you hold the same values as a company that you did when your MVV were created? How do you express your values? Is this the most effective way to express them? Has your view as a business in the world migrated elsewhere? Does your audience view the company how you want them to? 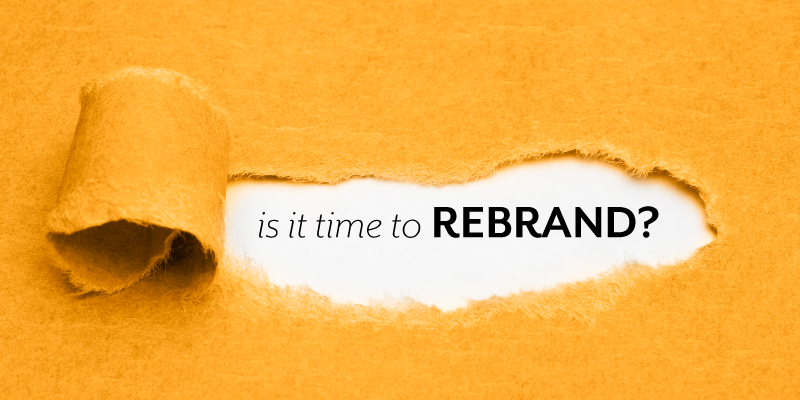 Beyond the above, it’s also critical that business owners truly understand that not only does the rebranding process itself take a good chunk of time, but so does the implementation process of the rebrand. The moment you sign off on your updated MVV, website, logo, content strategy, company culture policies, etc., doesn’t mean that all of these elements will be in full force immediately—nor will they immediately be noticed or make significant changes. From our experience as brand marketers, it takes at least 6–12 months to fully migrate brand updates and to see a cultural shift. That being the case, you must stay patient during this process. Consistently living out your brand standards both internally and externally every day will eventually yield the results you’re looking for, but commitment and consistency are absolute keys to your success. Rebranding is a complex process that is not to be taken lightly! Engaging with a professional branding firm is most definitely the way to go if you want to see effective results. Like we say on the Homepage of our site, "Great brands make it look easy, but they're the product of smart choices, experienced teams and really hard work." Not only does it take the commitment and consistency to give your brand the TLC it needs and deserves, but it also requires a team of professionals like The Image Shoppe to help your brand work as hard for you as you work for your customers and employees. Still not sure if you're ready to rebrand? Stay tuned for Part 2! If this post has piqued your interest, stay tuned—our brand strategist Greg Smith will dive deeper into this topic in a future TIS blog post! In the meantime, click here to view some of the work we've done for our clients, and please don't hesitate to contact us to discuss your branding needs. As your Brand Ally, that's what we're here for!